NOTE: None of the collectibles in this DLC count toward 100% completion for Kuwaq Yaku or the main game. The basic outfit and weapon are unlocked as soon as you install the DLC. The Shade/Shadow variants and the Grenadier Skill are unlocked upon completing the Echoes of the Past Side Mission. ABOUT THIS DLC: The first major DLC pack for Shadow of the Tomb Raider, titled The Forge, was released November 14, 2018. It is included in the Season Pass but can also be purchased separately from Steam, the Xbox Store, and the PlayStation Store. The Forge includes a story mission, which takes place in Kuwaq Yaku, as well as a Challenge Tomb that can be played either from within the main game or from the CHALLENGE TOMBS section of the Main Menu. This DLC also introduces co-op play, as well as Score Attack and Time Attack modes, similar to the Expedition modes in Rise of the Tomb Raider. This DLC also includes 5 Achievements/Trophies. If you just want to explore the tomb or try one of the new Attack modes, you can access these from the main menu. Choose CHALLENGE TOMBS > Additional Tombs > Forge of Destiny. You're then prompted to select either Score Attack (similar to the same mode from Rise of the Tomb Raider), Time Attack (reach the stele as quickly as possible), or Exploration mode. From this screen, you can also invite a friend or random player for a co-op session. You can also explore the Forge of Destiny Challenge Tomb in the course of completing the Echoes of the Past Side Mission within the main game. 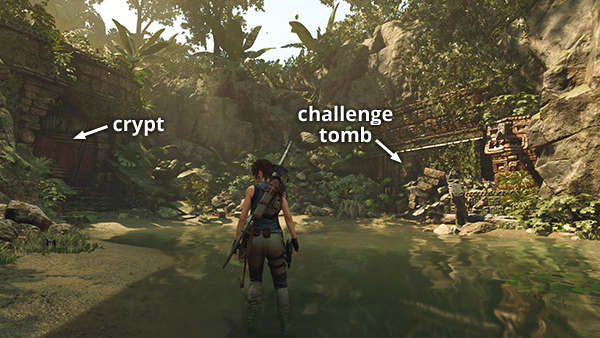 Follow this link to skip down to the CHALLENGE TOMB WALKTHROUGH. Check out Treeble's videos for Score Attack and Time Attack runs. Talk to her about the map she's holding and she'll explain that it was given to her by Abby's grandmother, Mariana, for safekeeping. Mariana wanted her granddaughter to have the map on the first anniversary of her death, which happens to be today. 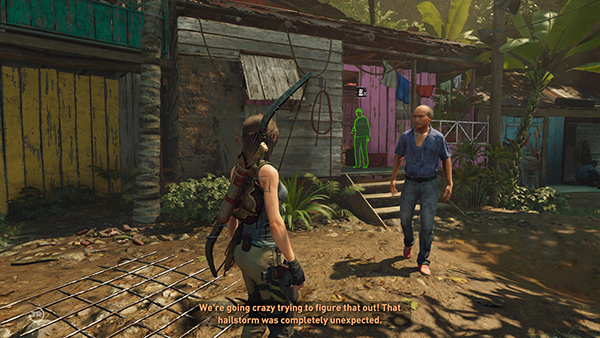 Lara agrees to help, and you receive Mariana's Map, which is added to The Hidden Past Story in the Artifacts Menu. Your objective is updated, and you can now track the mission on the Side Missions screen in your inventory. THE FORGE > ECHOES OF THE PAST > Meet Abby at Diego's House. Diego lives in the building near the COMMUNITY GARDENS at the northwest corner of the village. 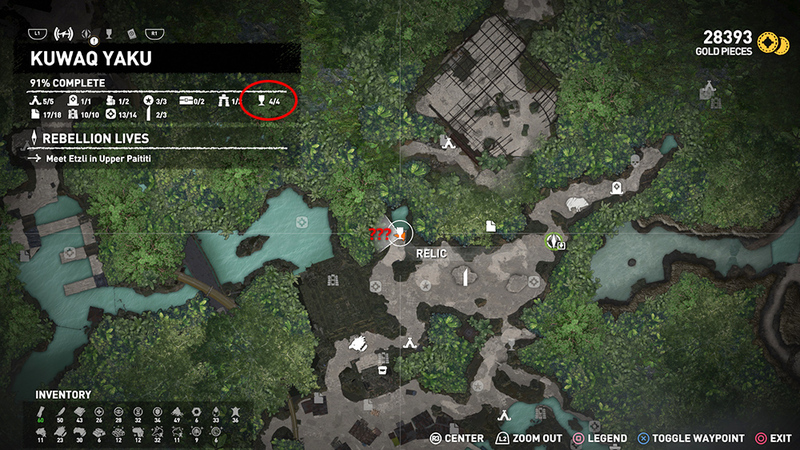 (screenshot) It's marked on your map with a green mission icon. 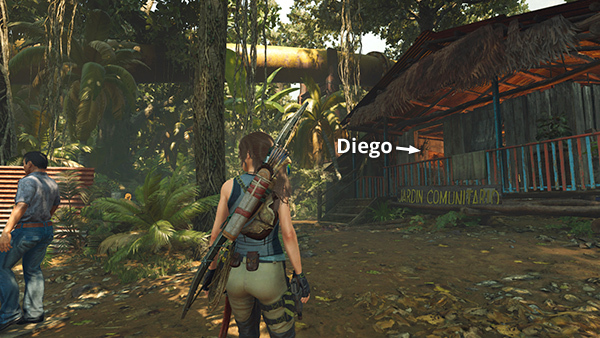 (screenshot) As you head that way, Lara contacts Abby on the walkie talkie to tell her about the map, and they agree to meet at Diego's. Lara arrives first. She and Diego examine the map, which it turns out he made for Mariana. Abby turns up soon after, and together they reveal some previously hidden information on the map: three X's marking points of interest. 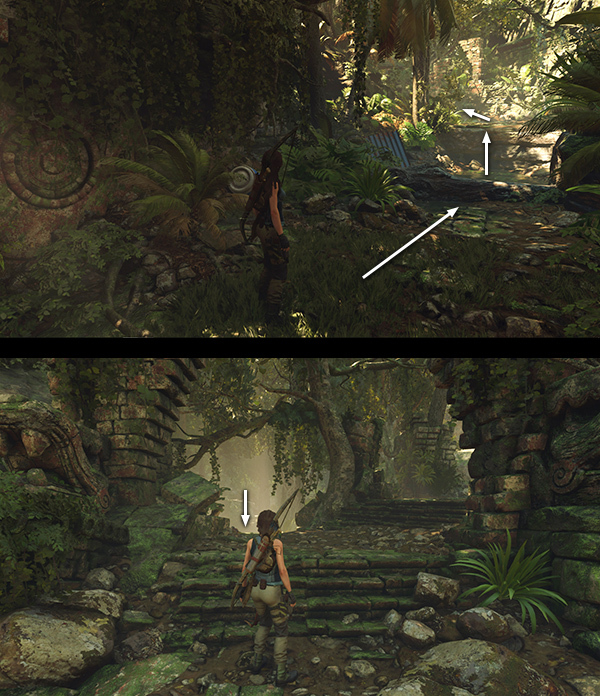 Lara and Abby agree to split up and investigate the marked areas, with Lara taking the two points north of the village. 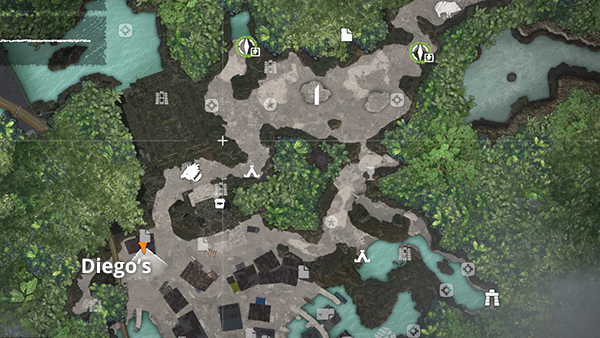 NOTE: If you are returning to this area later in the game, you may also want to go after any collectibles you missed before. There were a few things you couldn't get the first time because you didn't have the right gear or language skill. So check the KUWAK YAKU walkthrough, including the section at the end on revisiting the level, if you need help finding anything. If this is your first time in Kuwaq Yaku, there will be lots to do, so refer to the main walkthrough if necessary. FINDING THE FIRST 'X': The first 'X' is north-northeast of the village. To get there, exit Diego's place and turn left (north). Head up the steps, then to the right, between the back entrance to the MARKET and the temple to the north. NOTE: You may want to stop at the MARKET to buy and sell goods before setting out. In any case, be sure to use or sell some hides and black wolf hides to make space in your inventory, since you'll be fighting a pack of wolves shortly. NOTE: If you've already explored KUWAQ YAKU, you will have been through this area on the way to the HOWLING CAVES CHALLENGE TOMB. If this is your first time here, you may want to explore more thoroughly, since there are many collectibles here. The main walkthrough covers everything. RETURN TO THE VILLAGE: When you return to the game after examining the stone fragment, Abby hails Lara on the radio, saying she's found a third stone fragment. Your next goal: Meet Abby at Pilar's house, which is once again marked in green on your map. When you arrive, Pilar gives both Abby and Lara some unwanted hairstyling advice. Then they all get to work. When the three stone fragments are reassembled and aligned on Mariana's map, they point to a feature that Lara recognizes to be the Maya glyph for "Truth." Abby is puzzled by that and insists her family is Inca, not Maya, but she remembers that when she and her grandmother used to sit in that spot, her grandmother would tell her stories about the "hidden place." Abby then leaves Lara with the map and goes off on her own. THE HIDDEN PLACE: After the cutscene, two Artifacts are added to your The Hidden Past Story: Abby's fragment of the Chakana, The Final Piece (Mam/The Hidden Past) and Mariana's Location Revealed. 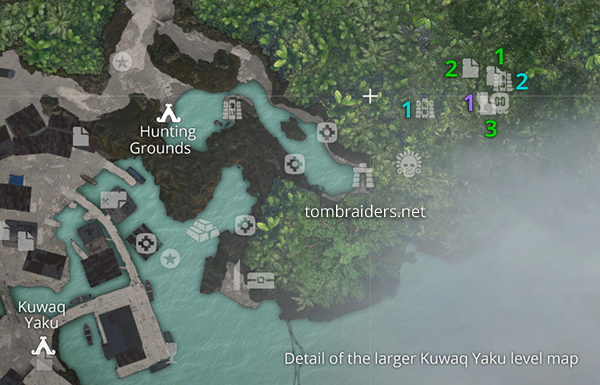 Your new objective is to Locate the tomb, and the area is marked on the in-game map. 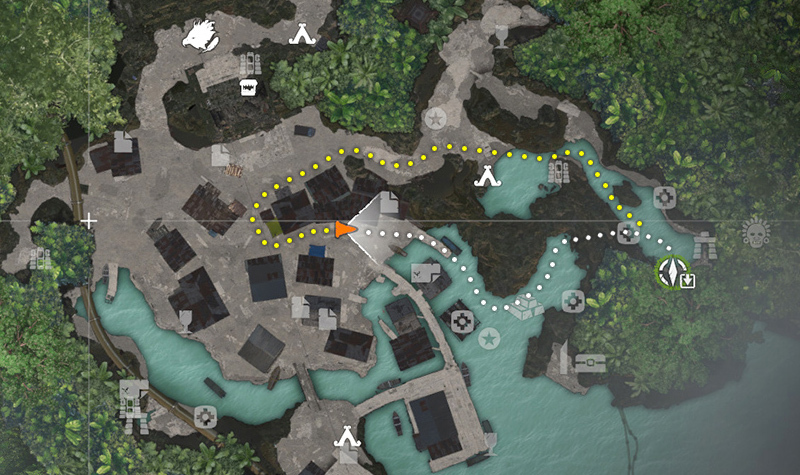 To get there from Pilar's either jump off the docks near the village and swim through the underwater tunnel near monolith #1, or head to the Hunting Grounds Base Camp, either on foot or via Fast Travel. Then follow the stream to the southeast. 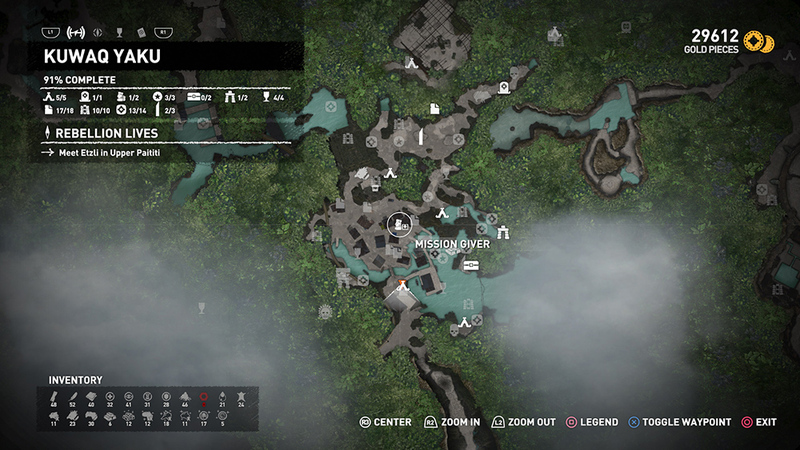 Both routes are shown in this screenshot. NOTE: If you take the underwater route, you'll pass right by treasure chest (1/2) on the way. So if you're revisiting this area after obtaining the LOCKPICK, you can open the chest now. Check the main walkthrough for details. The entrance to the SECOND CRYPT is very close to the entrance to Mariana's "Hidden Place." You'll need a shotgun to get through the barrier, but if you've completed the CENOTE level, you will have one by now. Again, the main walkthrough has more info. NOTE: You can also play the tomb from the CHALLENGE TOMBS section of the main menu. This is where you access co-op play, Score Attack, and Time Attack modes. See the intro for more info. The walkthrough below applies to the single-player Exploration mode, although there are no documents and relics in Exploration. SCORE & TIME ATTACK: If you're playing this tomb from the Challenge Tombs section of the main menu and need tips for the various Attack modes, check out these videos from Treeble: Score Attack | Time Attack. If you're playing the Echoes of the Past Side Mission, your goal will be updated when you enter the valley: Solve the secrets of the Hidden Place. NOTE: If you're playing the tomb as a stand-alone challenge, and not playing the story mission, you can ignore all of the references to documents, murals, etc. If you are playing the mission, at several points, Lara talks to Abby by walkie-talkie. Most of this is not crucial information, so I won't cover every exchange. NOTE: If you prefer, you can raise the left and middle ledges and run around to the left to reach the doorway, whichever works better for you. BUG NOTE: I encountered a glitch here, in which Lara would not jump to grab the counterweights. Reloading the checkpoint fixed it. NOTE: The stairs leading down from the landing with the mural take you back to the lower levels. Unless you missed something, you don't need to go back, but if you do drop down through this opening, you won't be able to climb back up the same way. Instead, you'll need to swing over to the ledges surrounding the tower. (screenshots) Use the counterweights to raise the ledges and reach the doorway on the northeast side of the cavern, just like you did before. Then retrace your route back to the area with the last jaguar-head switch and mural. FINAL CLIMB TO THE TOP: Use the horizontal bar to swing over to the nearest ledge on the tower. You're now headed for the sunny ledge above the carved head on the left (southeast) side of the cavern. You can't reach it directly, so follow the ledges around to the other side of the tower, where you can once again enter a small room in the center. Pick up a few supplies and use them to craft more fire arrows if you need them. Jump onto the counterweight to raise a ledge with a scoop outside the tower. Let go and run outside through the doorway on the right. Immediately turn left and shoot a fire arrow into the gas jet. The explosion propels the ledge around and upward again. Turn around so the tower is on Lara's right. Run along the ledges and jump onto the jutting ledge above the giant statue. We made it, Dad! Lara discovers a gilded sarcophagus belonging to an important person. As Lara tells Abby about her find over the radio, climb the steps on either side of the coffin. Examine the tomb stele to unlock the Grenadier Skill, which allows you craft grenades and launch them using any rifle. After examining the stele, the tomb is complete, and you unlock the Destiny's Trialed Achievement/Trophy. BACK TO THE VILLAGE: If you're playing the Echoes of the Past Side Mission, you're automatically returned to the tomb entrance in KUWAQ YAKU. You'll need to Return to Pilar's House in order to complete the mission. 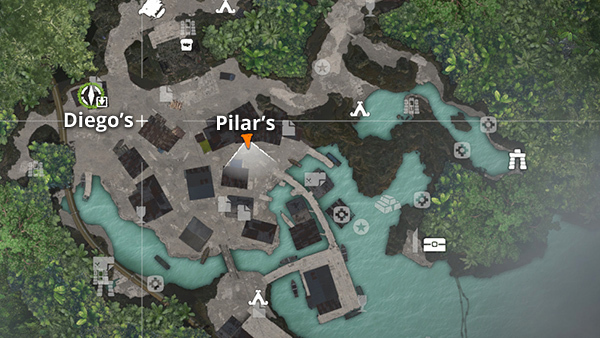 You've already been to Pilar's a few times, but her house is marked on your map in case you get disoriented. When Lara arrives at Pilar's, Abby is not far behind. Lara describes what she found, but Pilar already knows about the tomb, the final resting place of Abby's ancestor, Queen Aberrane. She explains that the queen was the first Guardian of Kuwaq Yaku and that she constructed a powerful artifact which has long since been lost. Even without the artifact itself, Aberrane's legacy has endured, and the guardianship has been passed down through the generations, all the way down to Abby. The younger woman is at first reluctant to accept all of this, but with a little help she realizes she's been acting as the village guardian all along. As Lara departs you gain a few rewards for completing the mission: the UMBRAGE 3-80 SHADE rifle and the Brocken - Shade Outfit. If this is your first time playing the mission, you'll also unlock the Heir Born Achievement/Trophy. To unlock the Bleeding Edge Achievement/Trophy, go to any Base Camp and equip this weapon and outfit combination. The other Achievements/Trophies for this DLC, Echoes of the Fast and Echoes of the Furious, require you to earn a Bronze, Silver, or Gold medal in Time Attack or Score Attack mode, respectively. 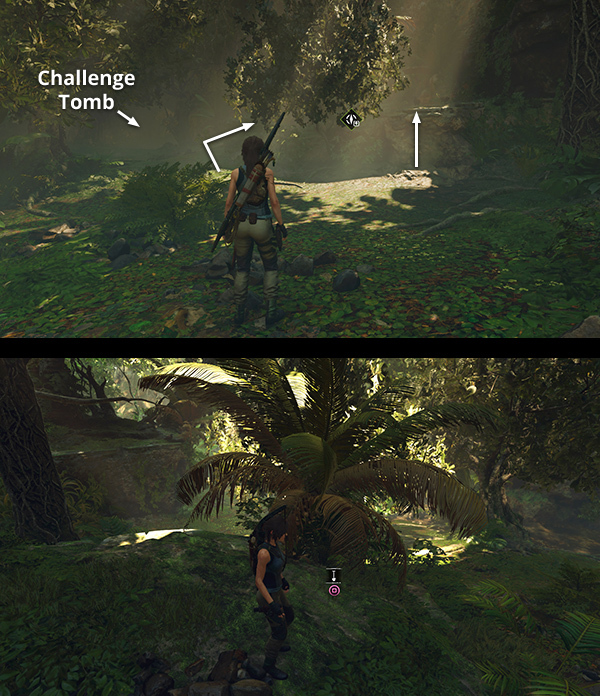 To do this, select CHALLENGE TOMBS from the Main Menu. Then choose Forge of Destiny from the list. Select Score Attack or Time Attack on the next screen and proceed. Again, check out Treeble's videos for Score Attack and Time Attack tips. †UPDATE HISTORY: 11/24/18 - First draft of walkthrough posted online. 12/20/18 - Made a few minor changes for clarity. 1/6/19 - Added note about when this DLC becomes accessible during the story progression. Thanks to Soumya for the heads-up. 2/10/19 - Added Score Attack and Time Attack videos, thanks to Treeble.